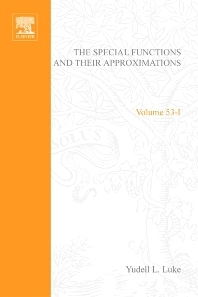 A detailed and self-contained and unified treatment of many mathematical functions which arise in applied problems, as well as the attendant mathematical theory for their approximations. many common features of the Bessel functions, Legendre functions, incomplete gamma functions, confluent hypergeometric functions, as well as of otherw, can be derived. Hitherto, many of the material upon which the volumes are based has been available only in papers scattered throughout the literature.